(Karnivool, Birds of Tokyo, I Am Giant). The debut album for These Four Walls 'Down Falls An Empire' is due for nationwide release through Universal Music NZ/Isaac Promotions on September 14 and they have a special pre-sale offer set up through www.amplifier.co.nz whereby the first 500 pre-orders will receive a signed, limited edition copy of the album, delivered to them on the release date. The wait is over for fans of Auckland’s THESE FOUR WALLS, as the band release their debut album Down Falls An Empire on Monday 14 September. The musical chemistry and song writing talents of guitarist Gray Vickers and vocalist Steve Gibb are undeniable, and have come together to create a bold, artistic statement from the band. Down Falls An Empire is musically diverse in its rock sensibilities, yet thematically consistent, taking the listener on a journey and presenting itself as a single piece of art as opposed to just a collection of songs. Ambitious for a debut album, the songs range in style from powerful guitar-driven anthems to melodic and beautiful passages, but thoughout the band retain their individuality and identity. THESE FOUR WALLS began pre-production for Down Falls An Empire in January with Chris Van De Geer (Stellar*, Solstate, Revolver) and commenced recording in May of this year with both Chris and producer/engineer Andrew Buckton (The D4, Steriogram, Midnight Youth). The foundations of the band began in 2007 with their first single ‘Walk Away’. The track gradually built momentum on commercial radio, breaking into the NZ Top 40, and featured on The Rock’s Top 30 for 12 weeks. In 2008, ‘Walk Away’ was featured in The Rock’s ‘Rock 1000 Countdown’ as the only song by an unsigned artist. The band’s next single releases, ‘Under The Shadows’ and ‘Fly Home’ were equally successful, also both breaking into the Top 40 Chart. Current single ‘Sweet December’ is already making an impact on radio stations nationwide and set to follow suit of its predecessors. THESE FOUR WALLS have been in high demand, and rightfully so. The band’s tight, heavy and energetic live performances have caught the attention of hundreds of music fans everywhere, leading the band being selected to showcase their new material at the Big Sound 09 music industry summit - one of the most respected and fastest growing music business events in the Asia Pacific region - in Brisbane later this month. THESE FOUR WALLS are also lined up to support international acts The Airbourne Toxic Event in Brisbane, plus Karnivool in Auckland in September. An extensive national tour is also scheduled later this year leading into a busy festival circuit over summer. The band are working towards an August 09 release, with distribution being handled by Isaac Promotions. 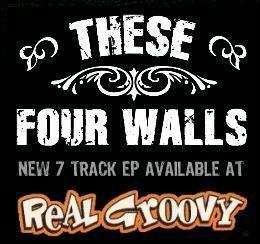 To follow the progress of the album, check online at www.thesefourwallsband.com and read the regularly updated blog section. The new These Four Walls single FLY HOME is released nationwide this week to radio and television stations. The song has already been picking up significant airplay on Northland's The Zone FM. It was even No. 2 on their Top 40 Rock Countdown last week. The song has also been officially released as a digital download from http://www.amplifier.co.nz/default,36448.sm - the cong is No. 1 on the Rock Chart after just two weeks, which is frickin amazing. You can purchase the track here for just $1.99. FLY HOME is available EXCLUSIVELY through www.amplifier.co.nz which means if you want a copy of the song, you'll have to buy it from here. It's not available in hard-copy at this stage, and won't be relased as such for some time. These Four Walls wishes to advise that the band has broken up to allow individual members to pursue new ventures. The band would like to thank all supporters, fellow musicians and people in the music industry for their outstanding support and encouragement over the last 15 months. This message was edited by nzaussiegirl on Wed Feb 22, 2006 12:59 pm.